We only stopped in to the Fullerton to have a look around on a recommendation from a friend of ours and then we saw the dessert cabinet........OH MY LORDY LOU....being that we visited around Easter we had a delicious white chocolate egg that had ANOTHER white chocolate egg inside of that and inside the second egg was coconut mousse with a mango yolk. Incredible delicious and rich...unless youâ€™re a little piggy, I suggest sharing it. If youâ€™re walking past and itâ€™s cake oâ€™clock, I suggest you do yourself a favour and stop by. You wonâ€™t be disappointed. Flights that land early â€˜amâ€™ are a pain. Mine landed at 5am, so you kinda are stuck wandering around till check-in. I got to the hotel around 1 (too tired and warm for any more wandering) was greeted by an amazing receptionist who immediately found me a room, where I could check into early (normally itâ€™s 3pm) and I was on my way to normality within 30mins after a hot shower! The hotel is beautiful.......the gym is amazing, and the pool area very nice as well. The Post bar was nice as well, go in there for the Merlion cocktail and the evening events - mine was some Latin thing. The rooftop bar was â€˜mehâ€™ nice view over to the Marina Bay Sands for the laser show (which was meh) but was very hot and muggy. 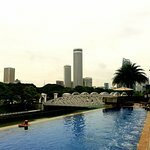 All in all a very nice and pleasant hotel, good location, and a 5min wall from Raffles Place MRT (perfect for the airport). 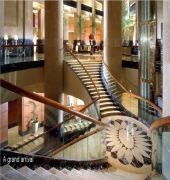 Beautiful hotel, great attentive staff. Beauty and Elegance is Timeless! A truly outstanding, beautiful and elegant Heritage property that lives up to its magnificent old world charm and just as importantly with the staff to match! From the well appointed rooms, to the Spa to the pool and restaurants and bars...brilliant! 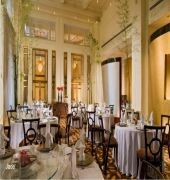 Nothing but care, consideration and sincere interest in making a stay at the Fullerton a truly memorable and 'magic' experience and one that will always be a timeless memory, just like the property itself! Special mention to Director of Room Operations Mr Boon Chun Khai for his outstanding service, assistance and kindness throughout our families stay. We had a one-night staycation over the Easter break. First we have to thank Sue who went above and beyond in making sure we got the room we had expected (Postmaster with a balcony). She really turned things around for us after a disappointing experience with check-in. The room was just what we wanted - comfortable big bed, massive bathroom and a small balcony overlooking Marina Bay Sands. We had a lovely afternoon tea at the Courtyard - free flow savouries and sweets with unlimited coffee and tea. The breakfast was good too despite the huge number of guests eating around 9am. 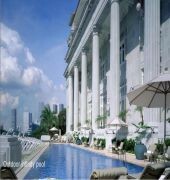 The pool is small but with a great view of the river and you can also cross the road and use the pool at the Fullerton Bay hotel. 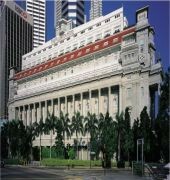 If you're looking for a hotel with history, near Singapore's CBD and MBS you will not be disappointed with the Fullerton.